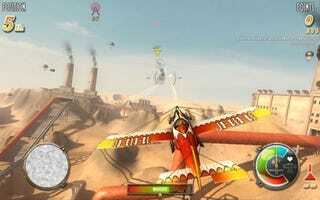 If Team Fortress 2 had an air supremacy mode, Dogfighter would be it. It really baffles me why this game isn't more popular. It's got a great look, fantastically responsive controls, a simple premise - Mario Kart meets the Red Baron in a fight to the death - and right now you can buy the game on Steam for a ridiculous $1.50. That's what you'll pay for some rubbish iPhone game, only in this case you're getting a full-featured PC combat game, with both multiplayer and singleplayer modes, and some of the wailingiest guitar riffs you'll hear this side of Aces High.